As the light blue sky quickly turned to night and stars shone brightly above the western hemisphere, students “ooh’d” and “ahh’d” from the gymnasium floor. “Wow! We’re flying!” one shouted. “This is crazy,” another muttered. Inside a 14-foot-by-24-foot inflatable canvas dome, the wonders of the world came to life. 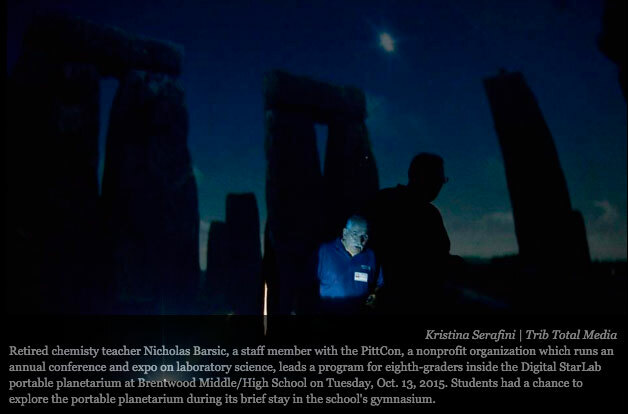 Brentwood Middle School seventh- and eighth-graders this month were transported to Stonehenge in England and the University of Pittsburgh’s Allegheny Observatory to view constellations in the March sky. A portable planetarium, mounted on the school’s gymnasium floor and utilizing a computer and projector, brought the Big Dipper, Orion’s Belt and the North Star to life. The portable planetarium, transported by volunteers and free to local school districts, is owned by PittCon, a nonprofit organization that runs an annual conference and exposition on laboratory science, cosponsored by the Spectroscopy Society of Pittsburgh and Society for Analytical Chemists of Pittsburgh.